Covelli Loyce "Coco" Crisp (born November 1, 1979) is an American former professional baseball outfielder. He played in Major League Baseball (MLB) for the Cleveland Indians, Boston Red Sox, Kansas City Royals, and Oakland Athletics. While primarily a center fielder throughout his career, Crisp also played left field for the Athletics and during his stints with the Indians. With the Red Sox, he won the 2007 World Series over the Colorado Rockies. Crisp was born in Los Angeles on November 1, 1979. He is the son of Loyce Crisp, a fast food restaurant owner and former amateur boxer, and Pamela Crisp, a former champion sprinter. He is a graduate of Major League Baseball's Reviving Baseball in Inner Cities Program. His maternal grandfather is Nick Newton, masters world record holder and inventor of cast aluminum starting blocks. He played on the 1995 Senior Division RBI World Series champions from Los Angeles. Crisp was originally nicknamed "Coco" by his sister who teased him that he looked like one of the characters on the Cocoa Krispies cereal box. The nickname was short-lived, until he started playing AA baseball when the team had all the players fill out a questionnaire to get to know one another. Covelli listed "Coco" as his nickname on the form and his teammates thought the name was funny so they had it put on the scoreboard during the game. He was traded to another team after a week and a half, but the nickname stuck and he has been "Coco Crisp" ever since. He officially changed his name on March 5, 2013. After Johnny Damon signed with the New York Yankees, the Red Sox sought Crisp to fill Damon's role as both leadoff hitter and in center field. In January 2006, the Red Sox sent prospect third baseman Andy Marte, pitcher Guillermo Mota, catcher Kelly Shoppach, a player to be named later (Minor Leaguer Randy Newsom), and cash considerations to the Indians for Crisp, catcher Josh Bard and pitcher David Riske. Crisp signed a three-year contract extension worth $15.5 million. Crisp broke his left index finger attempting to steal third base and spent the next 42 games on the disabled list and then finished the season with a broken left index finger. After returning to the Red Sox outfield on May 28, Kevin Youkilis had taken over the leadoff spot, and Crisp usually batted 7th or 8th in the line-up for the rest of the year. In 105 games, he had a .264 batting average with 8 home runs and 36 RBI. Besides his injury, Crisp's 2006 season may be best remembered for a catch against the New York Mets on June 29. Crisp began the 2007 season struggling offensively due to lingering effects of off season surgery to his left index finger . On April 20, 2007, Crisp fell over a short wall at Fenway Park while trying to catch a home run by Alex Rodriguez. Although he was unable to make the catch, missing by inches, he hit a game-tying triple off Mariano Rivera in the bottom of the eighth, then scored the go-ahead run on Alex Cora's soft line drive single. The Red Sox went on to win 7–6. During this season, he made numerous impressive catches in the outfield. It has even been claimed by one major league club that Crisp is easily the best defensive center fielder in all of Major League Baseball. Although he struggled at the plate throughout much of the season, between June 13 and July 23, Crisp raised his batting average from .221 to .284, a .402 average during that span. On June 18, entering the game with only two home runs in the season, Crisp belted two homers in the first multi-HR game of his career in a 9–4 loss to the Atlanta Braves. On August 5, Crisp was almost run over by the Seattle Mariners' mascot, the Mariner Moose. The Moose, driving a lap around Safeco Field's warning track on an ATV, nearly collided with Crisp as he was leaving the dugout for his position in the middle of the fifth inning; Crisp had to jump out of the way to avoid being hit. Red Sox pitching coach John Farrell was incensed by the mascot's actions and voiced his displeasure to both the mascot and Seattle's head groundskeeper. Immediately following the incident, the Red Sox received an apology from Mariners GM Bill Bavasi. On June 4, Crisp was the center of controversy in a game against the Tampa Bay Rays. While Crisp was trying to steal second base in the bottom of the sixth inning, Rays shortstop Jason Bartlett purposely placed his knee in front of the bag in an attempt to prevent Crisp from stealing the base. Crisp stole the base, but was not happy with this. On base again in the bottom of the eighth inning, he attempted another steal, this time taking out second baseman Akinori Iwamura on a hard slide. His slide was controversial and catalyzed the "payback pitch" the following game. During a pitching change in that inning, Rays manager Joe Maddon and Crisp argued, with Crisp in the dugout and Maddon on the pitching mound. After the game, Crisp said that he thought Bartlett would cover the bag, instead he (Bartlett) chose to tell Iwamura to take the throw in the eighth inning. Crisp described Bartlett's knee in front of the bag as a "Dirty" play. The very next game, in Crisp's first at bat in the bottom of the second, leading off the inning with the Sox up 3–1, Rays starter James Shields hit him on the thigh on the second pitch. Crisp charged the mound and first dodged a punch from Shields, and then threw a glancing punch at Shields, which set off a bench-clearing brawl. Crisp, Jonny Gomes, and Shields were ejected from the game. Major League Baseball suspended Crisp for seven games due to his actions in the brawl. Upon appeal, the suspension was reduced to five games, which he had served as of June 28, 2008. In Game 5 of the ALCS, Coco Crisp had a game-tying hit in the bottom of the 8th inning to cap Boston's 7-run comeback. Boston would go on to win the game 8–7 with a walk-off single in the ninth inning by J. D. Drew, but lose the series in 7 games. 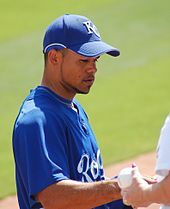 On November 19, 2008, Crisp was traded to the Kansas City Royals for relief pitcher Ramón Ramírez. During his lone season with the Royals, Crisp's started off hot hitting well over .300 before his batting average fell to a career low .228 due to shoulder injuries. On June 23, 2009, Royals manager Trey Hillman announced that Crisp would receive season ending surgeries to repair a labrum tear in both shoulders. After the 2009 season, Crisp signed a one-year contract with the Oakland Athletics worth $5 million, with a club option for 2011. Crisp began the 2010 season on the 15-day DL with a fractured left pinkie finger. Crisp entered the 2011 season exercising his one-year option with the Oakland Athletics. On August 24, Crisp homered from both sides of the plate against the New York Yankees. In that game, he hit a game-winning three-run home run in the top of the 10th inning on the first pitch he saw against reliever Rafael Soriano. Crisp re-signed with Athletics on January 3, 2012, on a two-year, $14 million deal with a club option for 2014. Crisp had received other offers from clubs such as the Baltimore Orioles and Chicago White Sox as well, but declined them both. After the 2013 season, the Athletics exercised their club option on Crisp for the 2014 season. Before the 2014 season, Crisp signed an extension with the Athletics covering the 2015 and 2016 seasons. The contract guaranteed him $11 million in each of the 2015 and 2016 seasons, and had a vesting option for the 2017 season. Crisp's playing time was reduced in 2016, leading him to believe that the Athletics were intentionally preventing his 2017 option from vesting. In 2015, he batted a career-low .175 and had the lowest on-base percentage (.252) and slugging percentage (.222) of his career, as on defense he played exclusively in left field. On August 31, 2016, the Athletics traded Crisp with cash considerations to the Indians for Colt Hynes. Before he agreed to waive his no-trade clause, Chris Antonetti, the Indians' general manager, spoke with Crisp to tell him that he would not receive enough playing time in Cleveland for his option to vest. In 2016, he batted .208 for Cleveland. Crisp became a free agent following the 2016 season after he failed to meet the contractual incentives that would have caused his vesting option for 2017 to trigger. In July 2017, Crisp became the head coach of the Shadow Hills High School baseball team. In February 2019, it was announced that Crisp would be joining the Oakland Athletics Radio Network as a part-time color analyst, working alongside Ken Korach and Vince Cotroneo in the booth for 33 games in the 2019 season. Crisp was known for having great range in center field, but also for having a below average throwing arm. At the height of his career, Crisp was considered one of the best base-stealers in the game and a generally aggressive baserunner. He owns the Athletics franchise record for most consecutive stolen bases without being caught. He was known to be a good "small-ball" type player because of his good bunting skills but also had respectable power. Crisp had also only been hit by a pitch five times in his fifteen-year career. Crisp is of Italian, African American and Puerto Rican descent. His father is of Puerto Rican and Italian descent and his mother is African American. He is married and has four children: three sons and a daughter. He and his family used to live in Desert Hot Springs, California but now they all live in Rancho Mirage, California. ^ "Coco Crisp Baseball Stats by Baseball Almanac". Baseball-almanac.com. Retrieved February 7, 2014. ^ Dodd, Rustin. "Crisp shares a knockout story of his dad". MLB.com. Retrieved August 27, 2014. ^ "MLB's RBI program enters 20th year | MLB.com: News". Mlb.mlb.com. May 24, 2013. Retrieved February 7, 2014. ^ "Topic Index". Multimedia.foxsports.com. November 19, 2013. Archived from the original on October 4, 2011. Retrieved February 7, 2014. ^ "Tribe finalizes two deals in a day". Major League Baseball. Retrieved September 10, 2016. ^ "Cuckoo for Coco: Red Sox, Crisp agree to extension". ESPN.com. April 12, 2006. Retrieved September 10, 2016. ^ boston.com Their only close call was a moose on the loose, Dan Shaughnessy, 8/6/2007. ^ Gaddis, Carter (June 6, 2008). "Strikeouts Concern Maddon". The Tampa Tribune. ^ Smith, Joe (June 5, 2008). "Red Sox retake first from Rays 5–1". St. Petersburg Times. ^ Ortiz, Jorge L. (June 6, 2008). "Even MVPs can be benched for not hustling". USA Today. ^ Amalie Benjamin (June 6, 2008). "Red Sox outfight Rays: Brawl precedes Ellsbury injury". Boston Globe. Retrieved June 27, 2008. ^ "National Sports Briefs". Associated Press. June 7, 2008. ^ Gordon Edes (June 27, 2008). "Crisp suspension reduced". Boston Globe. Retrieved June 27, 2008. ^ "Royals acquire Coco Crisp from Red Sox for Ramon Ramirez". Kansascity.royals.mlb.com. Retrieved February 7, 2014. ^ "Crisp to miss remainder of season". Kansascity.royals.mlb.com. Retrieved February 7, 2014. ^ "Athletics close to deal with Crisp | oaklandathletics.com: News". Oakland.athletics.mlb.com. Retrieved February 7, 2014. ^ "A's agree to terms with OF Coco Crisp on one-year contract | oaklandathletics.com: Official Info". Oakland.athletics.mlb.com. Retrieved February 7, 2014. ^ "Oakland A's Coco Crisp (fractured pinkie) to start year on disabled list - ESPN". Sports.espn.go.com. April 3, 2010. Retrieved February 7, 2014. ^ "Oakland Athletics Exercise Coco Crisp, Mark Ellis Options, Decline Eric Chavez Option - SB Nation Bay Area". Bayarea.sbnation.com. Retrieved February 7, 2014. ^ "AP Source: CF Coco Crisp agrees to deal with A's". The Boston Globe. ^ "Coco Crisp staying with A's". Associated Press. ESPN.com. February 7, 2014. Retrieved February 7, 2014. ^ Slusser, Susan. "Coco Crisp signs two-year extension, with 2017 option - Oakland Athletics : The Drumbeat". Blog.sfgate.com. Retrieved February 7, 2014. ^ Slusser, Susan (August 15, 2016). "Coco Crisp 'hurt,' believes A's trying to prevent option". San Francisco Chronicle. Retrieved August 23, 2016. ^ Hoynes, Paul (August 31, 2016). "Coco Crisp, the anti-Lucroy, could have nixed trade to Cleveland Indians, but didn't". Cleveland Plain Dealer. Retrieved September 1, 2016. ^ Arthur, Blake (July 10, 2017). "Former MLB player Coco Crisp named new head baseball coach at Shadow Hills". kesq.com. Retrieved August 24, 2017. ^ Lee, Jane (February 19, 2019). "Crisp joining A's radio team as analyst". MLB.com. Retrieved February 25, 2019. 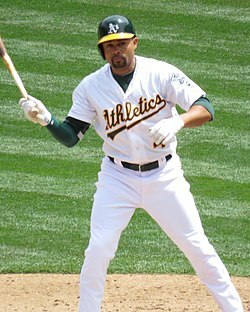 ^ "Coco Crisp continues to improve franchise record" Accessed July 4, 2012. ^ Weinberg, Neil (January 13, 2017). "The Man Who Hasn't Been Hit in Almost Six Years". FanGraphs. Retrieved January 14, 2017. ^ Murphy, Rosalie (May 24, 2016). "Coco Crisp selling Rancho Mirage mansion for $9.99M". The Desert Sun. Palm Springs, California: USA Today Network. 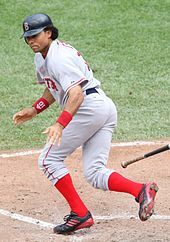 Wikimedia Commons has media related to Coco Crisp. This page was last edited on 26 March 2019, at 04:02 (UTC).